We made it safely to Rock Point last evening. I manned the helm for much of the day, as it was relatively calm sailing. I even drove the boat into our anchorage spot and backed the anchor down to help set it. Woohoo! Spinny seemed a bit sad to have Carol gone yesterday and appeared to be tired and mopey. However, this morning she’d still not touched her food and her nose felt a little warm to the touch. Poor Spinny seems to be sick as a dog. Hopefully it’s nothing too serious. We were REALLY rocking and rolling today. When we got out onto the sound, the waves were much larger than we expected. Water pored in over the bow and seeped through the closed hatch over the electronics. Gary and I rushed down to clean up the mess that was the cabin. Everything was battened down as much as normal, but apparently that wasn’t well enough for today. Sitting in the cabin too long felt like an amusement ride gone wrong, and I found myself sea sick again. 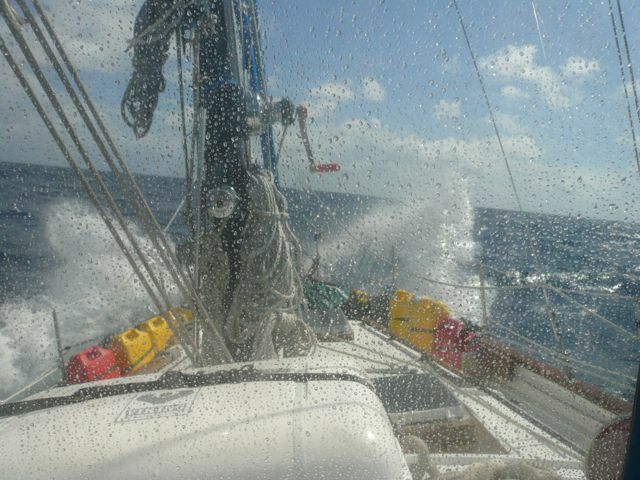 We all felt great relief when the sails went up, helping to stabilize us in the rough seas. If you thought our troubles were over now, you are quite wrong. Sick dog, sick Emily, water in the cabin, drenched electronics, chicken broth spilled all over the kitchen, rolling seas. Oh no, this isn’t enough. A squall was building in the distance and descending down was a nice little wisp of a funnel cloud. A potential water spout in the making. Luckily this was easily avoided with a slight course change. None of the day thus far was really that disastrous or unfixable, but it certainly makes for a more interesting crossing over to Eluthra. The day wasn’t all that bad. Gary did catch another smaller mahi mahi on the way over, but released him as we still have some mahi mahi meat in the freezer. Still, we were all glad to anchor safely in Rock Sound harbor. To celebrate we took an evening walk through the town and found a good dinner of hamburgers at the 4 Points Restaurant. Spinny even ate a bit of hamburger herself and played a game of fetch. Spirits were certainly lifted all around with our walk into town. We’re looking forward to exploring Rock Sound further in the morning. Supposedly they look like white horses. Waves wash over the deck. Luscious grass and trees at Rock Sound. Palm tree sunset at 4 Points Restaurant.